This month I didn't have as many favorites as last month. Ironically all the things I am going to be writing about are all things that are new to me. I love getting new things that instantly become my favorites! My first favorite is the Tartelette In Bloom palette, and it is so amazing! I bought it on a whim because when it first came out I didn't think about picking it up but then randomly I decided I wanted to buy it. The shades in this palette are perfect for everyday and night time looks. Literally the whole month of May I only used this palette. The only time I would use a different palette was if I wanted a pop of color, but besides that this is all I used. I even used the darks shades which is surprising because I usually shy away from dark eyeshadows. One thing I did notice about the palette is that it kind of smells like the Too Faced Chocolate Bar palette. I don't think it is infused with cocoa powder like the Too Faced palettes so it is crazy it smells like chocolate! My most favorite colors in the palette are 'smarty pants', 'rebel', 'jetsetter', and 'rocker'. I love all the shades, but those are my standouts at the moment! I am so glad I picked this palette up because it is easily one of my favorite palettes now! The most hyped brand this month I think was BECCA because this month Jaclyn Hill released her extension of her Champagne Pop highlight collaboration. So as soon as trendmood announced that the Champagne Glow palette was released early on Sephora's app I instantly downloaded the app so I could buy it. Thankfully, I was able to get one because I heard it sold out so quickly! It is the best highlight blush palette, and I can't get enough of it! I will be doing a separate full review on it in the next few weeks! But so far, I am absolutely loving it! 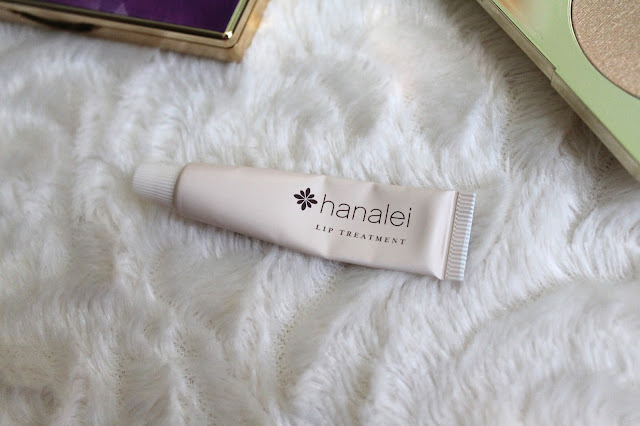 I gave a review on the Hanalei Lip Treatment in my ipsy bag review, so if you want a more in depth review go read about it here. But I got this lip treatment in my ipsy bad, and I am loving it so much! It is perfect for making my lips feel smooth and not look cracked or crusty. I think it'll be perfect when winter comes too. As soon as I run out of this I will be buying the full size. Luckily ipsy offer's discount codes for all the brands that are featured in that month's bag. If you want to try this lip treatment out (I recommend you do!) the code to get 30% off is "HANALEI30" on Hanalei's website! These were the only products this month that were really stand outs for me. I stuck with my usual makeup routine, and I wasn't really wowed by anything else this month. I just made two makeup orders for a few things, so I am ready to test out some new things for June! I have my eye on a few new things coming out I want to test out! What were your favorites this month? Have you tried anything new recently? Let me know in the comments!